I saw you mention possible VT100-Support in one of your earlier posts. 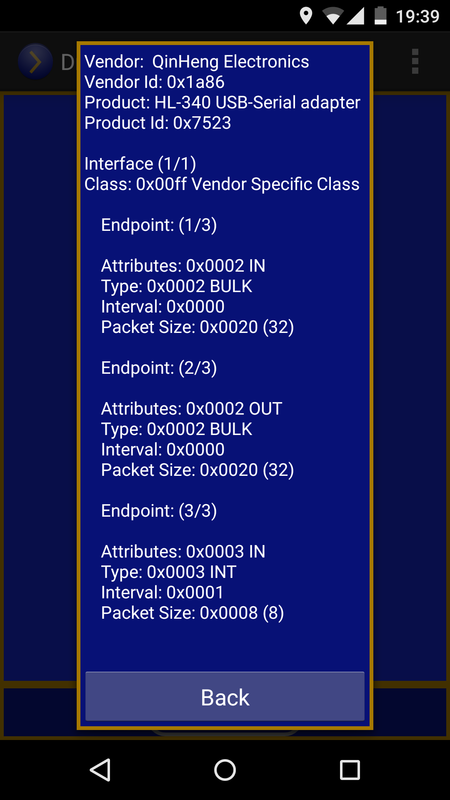 Have a look at BlueTerm (https://play.google.com/store/apps/details?id=es.pymasde.blueterm), it has VT100 and it’s open source, so it should be relatively easy to port to DroidTerm! Thank you very much!! I will take a look as soon as possible. Probably you are right, it should be easy to port to DroidTerm. Thank’s you very much. Your app is the best .the most rapid recognizing interface. My principal use is for send command to motor ecu via OBD interface. It’s possible to send hex command by your software ?. Excuse me for my poor english .Thank’S you very much. That is one of the next features I would like to add. It can be very useful for debugging purposes and no so much time ago I missed it! Those CH340 always causing troubles! I am afraid I don’t own any of the generation. I would really appreciate it a report or log with the new calls necessary to initialize them.